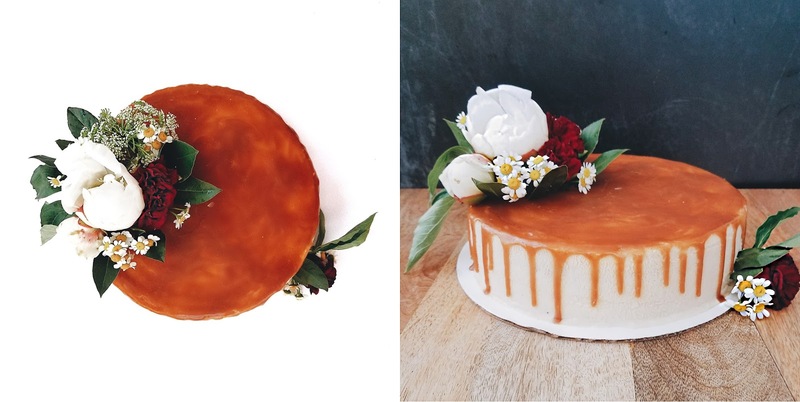 tl;dr - I baked an earl grey cheesecake with salty dark caramel for a friend's wedding. Read on for the recipe and the story of how I decided upon these flavors for the couple! 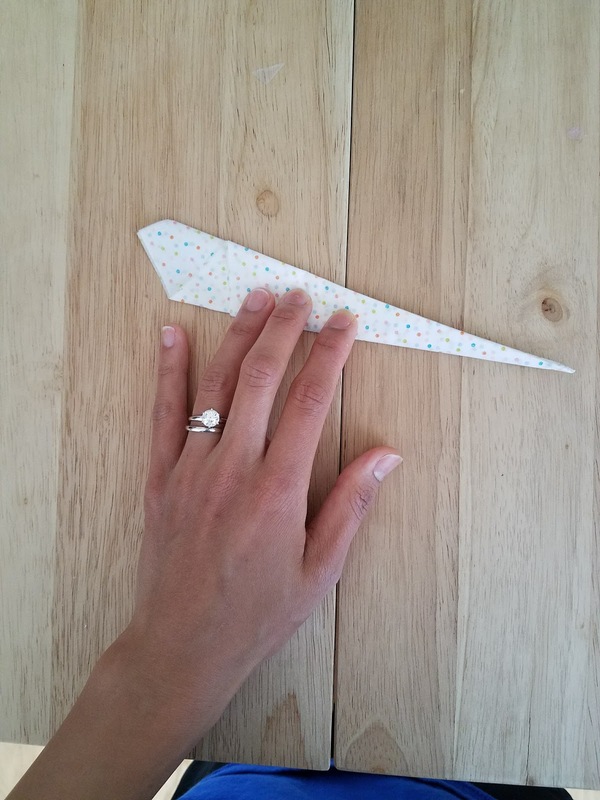 Kristine's Instagram handle is @ngastywoman (the greatness of that handle is worthy of another blogpost entirely, but I digress...), and if you click through to the post, you'll see her mention that earl grey is her "fave." Done! An earl grey cheesecake it would be. Bam! This piece of evidence sealed the deal for the salty dark caramel topping. Stamp of approval from both the bride and the bride's sister. The flowers at their Australian ceremony were incredible! 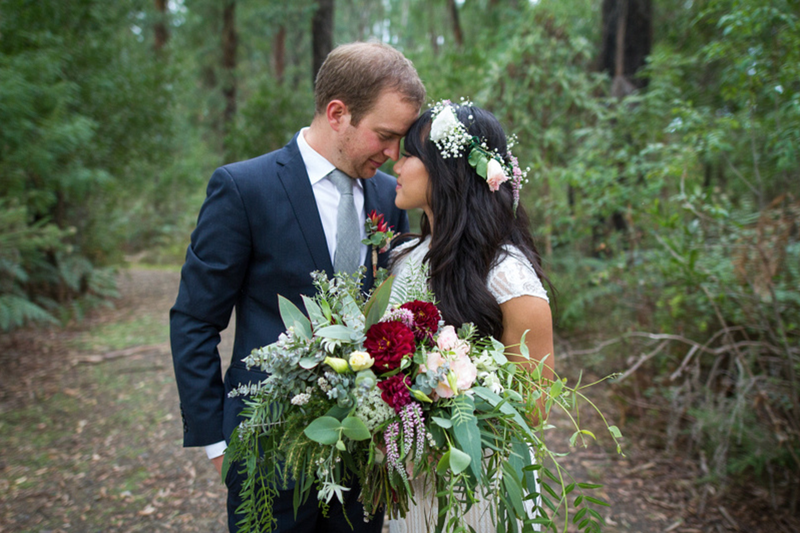 Deep red and white blooms with loose sage-colored foliage adorned Kristine's flower crown and bouquet. Sophisticated, modern, and wild at the same time. So I set out to recreate the colors and textures of those flowers in their California wedding cheesecake, using four different food-safe flowers: peonies, chamomile, green mist, and carnations. The result was a rich, hefty cheesecake infused with fragrant earl grey tea and topped with chewy, buttery, dark salted caramel. I think they liked it! Maximize the earl grey-ness: To infuse the cheesecake with a strong earl grey flavor, soak earl grey tea bags in heavy cream over 2-3 nights, making a cold-brewed tea with cream instead of water. I used the tea-infused cream in the cheesecake filling and in the ganache that coated the cheesecake. You can use the tea-infused cream for the caramel as well, but I chose to keep the earl grey flavor separate from the caramel topping. Make sure the cream cheese is room temperature: This recipe will not work if the cream cheese is straight out of the fridge. You'll end up with chunks of unblended cold cream cheese in your cheesecake filling. Let the cream cheese get to room temperature overnight, or if you're in a pinch, put the cream cheese block in the microwave for 5 seconds on each side to get it softer. Bake the cheesecake at least two days in advance of event: After baking, I like to let the cheesecake cool at room temperature inside the oven overnight. Then, I freeze it for at least 4-5 hours before I pop it out of the springform pan to decorate it. Use a water bath and wet cake strips to prevent cracks: Many recipes recommend covering the outside of your springform pan with aluminum foil and submerging the pan halfway into a roasting pan filled with boiling water. 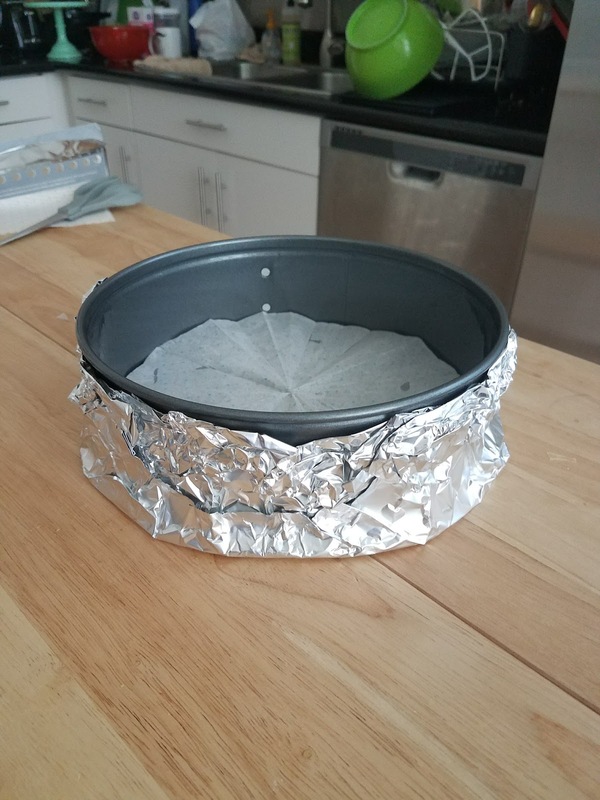 I don't own a roasting pan, and I've found that filling a shallow cookie sheet with non-boiling water works fine, so long as you wrap the pan with moistened velcro cake strips in addition to the foil. 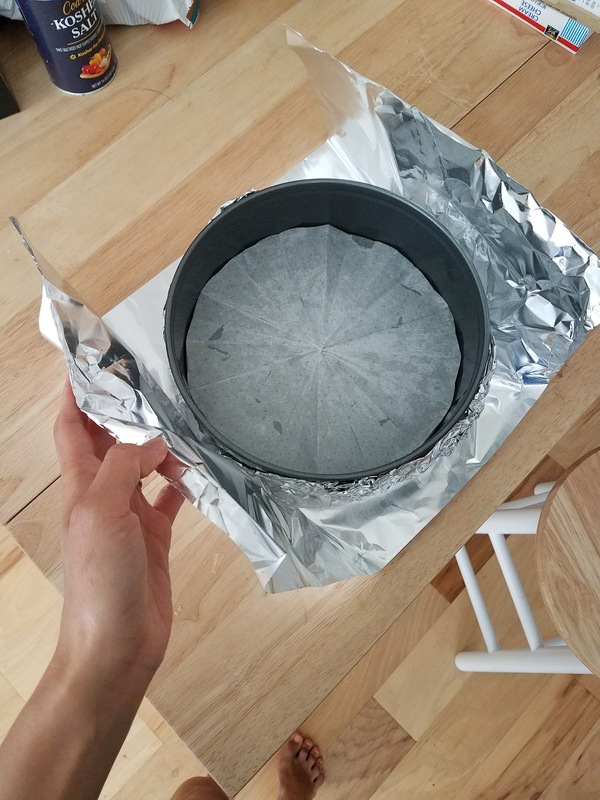 These precautions help the cheesecake bake evenly so you don't end up with a big crack in the center (though if you do, you can cover it with fruit, whipped cream, and/or other decorations, no sweat). Cool the cheesecake slowly to prevent cracks: Once the cheesecake is done baking (the edges should be slightly separated from the pan, and the middle should still be jiggly), turn the oven off and open the door slightly. Leave it like this for a few hours, until the cheesecake is room temperature (I like to bake the cheesecake in the evening and cool it in the oven while I'm asleep). 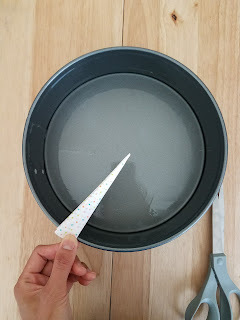 Freeze the cheesecake before you remove it from the springform pan for crisp, clean sides: Every time I try to cut a room-temperature or even a refrigerated cheesecake out of a pan, I get ripples and uneven edges. I prefer freezing the cooled cheesecake for at least 4-5 hours before I pop it out of the springform pan in a perfect frozen cylindrical shape, no knife required. Sounds like a lot to take in, but I promise, this cheesecake is simple, and the tangy, fragrant flavor is well worth it! In a small bowl, soak 2 tea bags in 2/3 cup of heavy cream. Cover the bowl and put it into the refrigerator. Allow the flavor to infuse overnight, or over 2-3 nights for a deeper earl grey tea flavor. 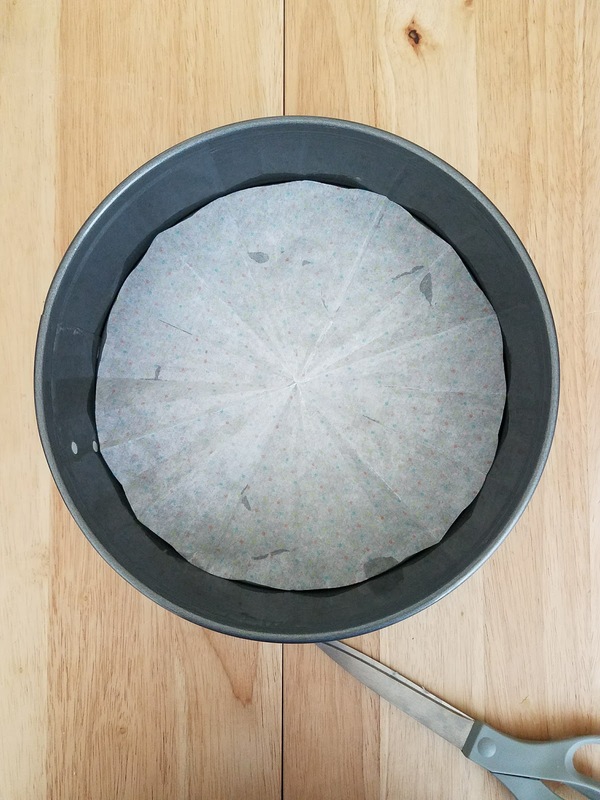 Coat the sides of a 9-inch diameter springform pan with cooking spray (this makes it easy to pop out of the pan after the cheesecake's been frozen). Line the bottom of the pan with a parchment paper round (see above for a trick on how to quickly and easily cut a paper round). Crush 2 cups of speculoos cookies in a food processor until they become powdery crumbs. Set aside. Add 1/4 cup macadamia nuts into the food processor and blend until they become a spreadable, buttery consistency. Mix the cookie crumbs, blended macadamia nuts, and 4 tablespoons melted butter by hand with a rubber spatula until it becomes the texture of gritty damp sand. Dump the mixture into the prepared springform pan and use your fingers to create a flat, even crust layer. Stick the pan into the 350 degree F oven for 10 minutes. Set pan aside to cool. Turn oven temperature down to 325 degrees Fahrenheit. 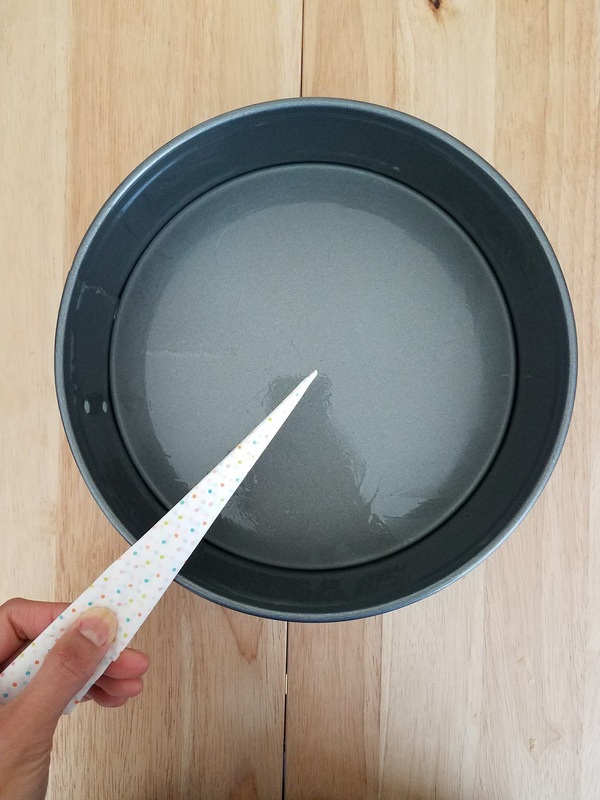 Submerge velcro cake strips into a Tupperware filled with cold water. 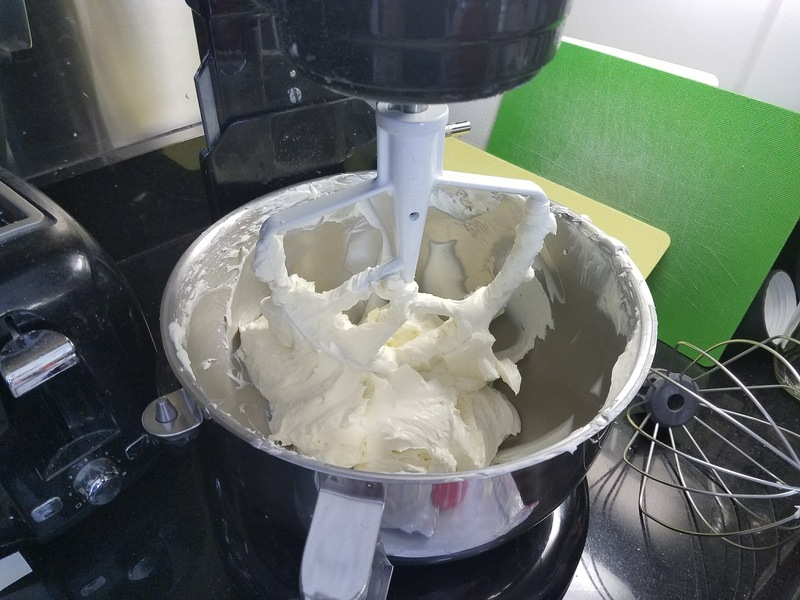 Place 4 8oz blocks of room-temperature cream cheese into the bowl of an electric mixer with the paddle attachment. 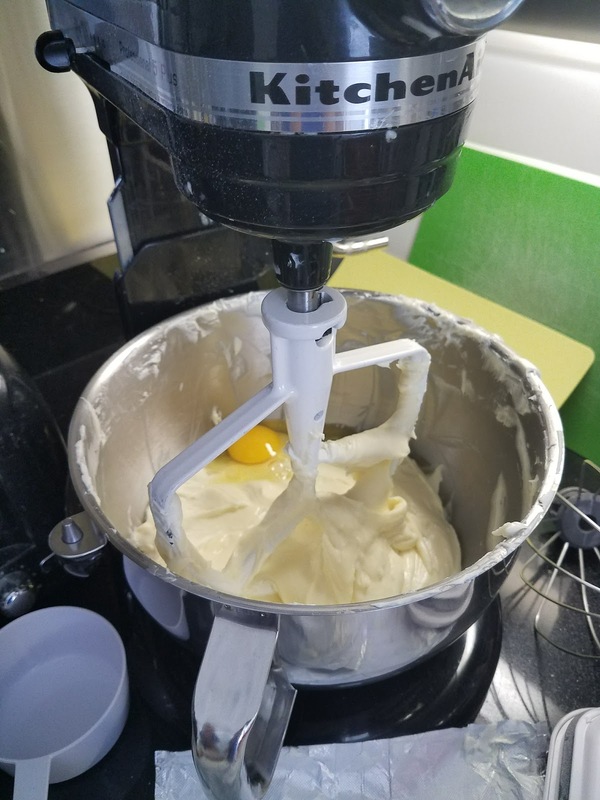 Mix on medium speed for 4 minutes until the cream cheese is soft, smooth, creamy, and free of chunks. Add 1 1/3 cups of granulated sugar, and beat 4 more minutes. Add pinch of salt and 2 teaspoons vanilla, beating at low speed after each addition. Add 4 eggs, 1 at a time, beating at low speed after each one. Add 2/3 cup sour cream, beating at low speed after the addition. Take the tea bags out of the earl-grey infused heavy cream, and add 2/3 cups of cream to the cheesecake filling. Beat at low speed until just smooth and well-incorporated (do not overbeat). Pour the filling into the foil-wrapped pan, over the cooled crust. Shake it gently on a flat surface to get a smooth, flat cheesecake top. To get a deeper earl grey flavor into the cheesecake, grind 7-10 earl grey tea bag's worth of tea leaves in a coffee grinder. Pour the grounds directly into the cheesecake filling and stir until well-incorporated. 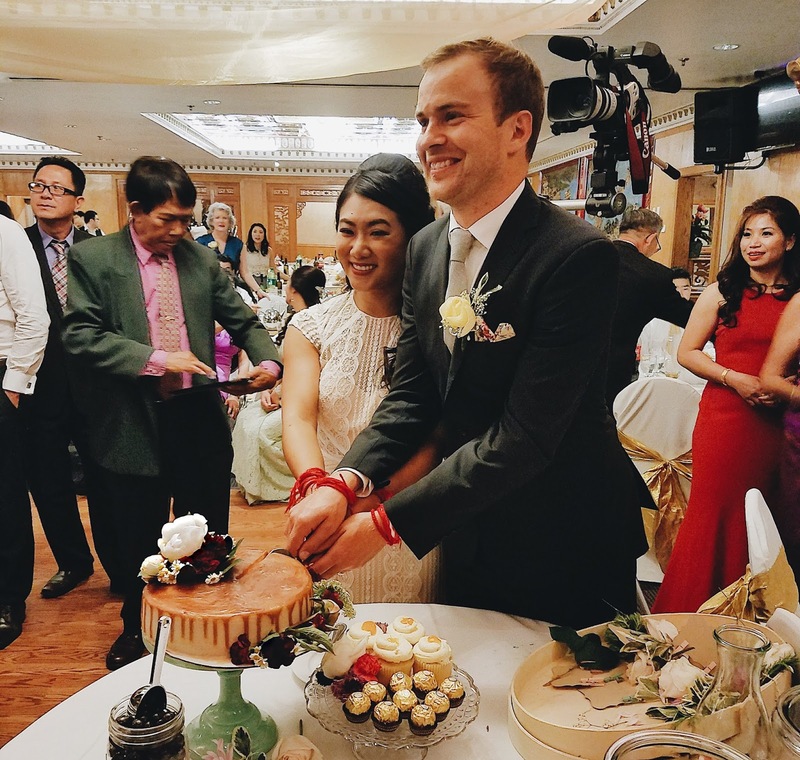 I did it this way so that when Kristine and Morten cut into the cake, they'd see an ombre effect, with an off-white bottom that fades into a dark earl grey tea leaf-studded top. Pour just enough of the filling to cover the cooled crust. Tear open one bag of earl grey tea. Grind the dry leaves into powder in a coffee grinder. Pour the powder into the remaining filling. Stir until well-incorporated. Pour just enough filling to cover the first layer of filling in the pan. Repeat step #2 with two bags of earl grey tea for the third layer, and then three tea bags for the fourth layer, and then four tea bags for the fifth layer until all the filling is in the pan. Shake the pan gently on a flat surface to get a smooth, flat cheesecake top. 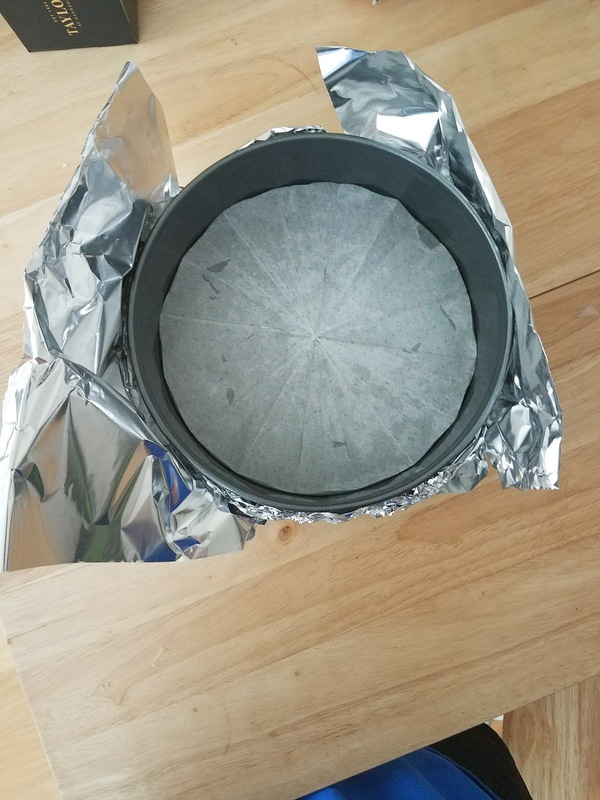 Place the foil-wrapped pan onto a cookie sheet with raised edges. 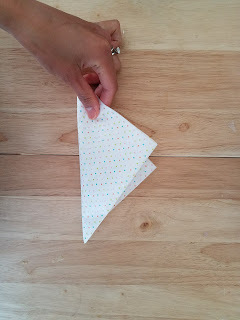 Take the velcro cake strips out of the water. Gently squeeze out some excess water. Wrap the cake strips around the foil-wrapped pan. Place the cookie sheet into the middle of the 325 degrees F oven. Pour boiling water onto the cookie sheet until the cheesecake is about one centimeter deep in water. Bake for 1 hour and 15 minutes, up to 1 hour and 30 minutes, until the edges are stiff and starting to separate from the pan, and the center jiggles when you gently shake it in the oven. Open the oven door a crack and let the cheesecake get to room temperature over at least 2 hours. Once the cheesecake is at room temperature, remove the velcro strips and foil. Place the cheesecake into the freezer. While the cheesecake is freezing, make caramel. Pour 1 cup of sugar into a shiny silver saucepan. Drizzle 4 tablespoons of cold water along the inner sides of the pan. Add a quarter-sized dollop of light corn syrup. Cook at medium heat without stirring. When the mixture starts to brown, insert a thermometer. Continue heating until the mixture reaches 400 degrees Fahrenheit. Take the pan off heat. Dump 4 tablespoons of room temperature butter into the mixture. It will sputter and bubble up like crazy - be careful as the mixture is very hot. Stir with a rubber spatula until the butter is well-incorporated. Add 1/2 cups of room temperature heavy cream. The mixture will sputter and bubble up once more. Stir with a rubber spatula until the heavy cream is well-incorporated. Add the 1/2 teaspoon of salt and stir. Carefully pour the hot caramel into a glass or ceramic container and cover. Let the caramel come to room temperature for 2-3 hours. Then, store in fridge until ready to use. At least one day before making the ganache, place 3 earl grey tea bags into 1/3 cups of heavy cream. Stick it into the refrigerator overnight (or over 2-3 nights for a more intense earl grey flavor). Place 12 ounces of chopped white chocolate (or white chocolate chips) into a heat-proof bowl. Heat the heavy cream with the earl grey tea bags in a saucepan at low to medium heat, stirring gently until it just starts to boil. Pour the hot heavy cream through a sieve (to catch the tea bags) into the white chocolate. Swirl the cream around the chocolate to ensure all chocolate pieces are in contact with the hot cream. Wait 5 minutes. Use a whisk to incorporate the cream and white chocolate into a smooth, spreadable ganache. If there are still some white chocolate pieces left after whisking, pour the ganache into a storage container through a sieve. If the ganache is too runny to be spreadable, stick it in the refrigerator for an hour. 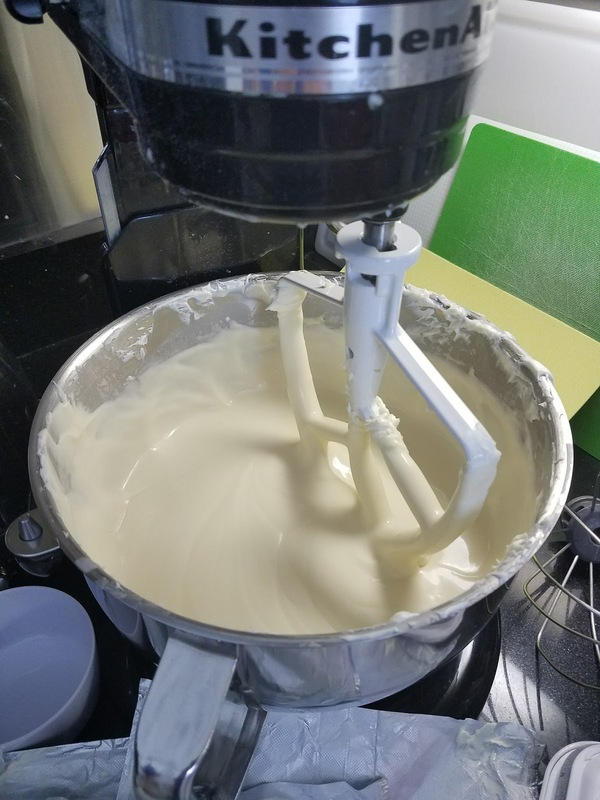 If still too runny after refrigerating, whip it gently with a stand mixer using the whisk attachment (be careful not to overwhip and turn the mixture into butter - it only takes a few seconds to whip ganache). Take the cheesecake out of the freezer. Pop it out of the springform pan. 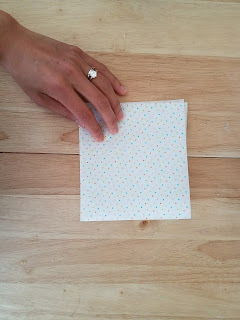 If it resists, warm the sides of pan with your hands before gently un-doing the springform top. It should give way eventually, and you'll marvel at the crisp, clean edges on your frozen cheesecake. Also, if you poured in your filling the "craziest" way, you can bask in the glory of the pretty ombre layers of your cheesecake. Spread a thin layer of ganache on a cardboard cake board. Place the frozen cheesecake onto the ganache to stick it to the board. 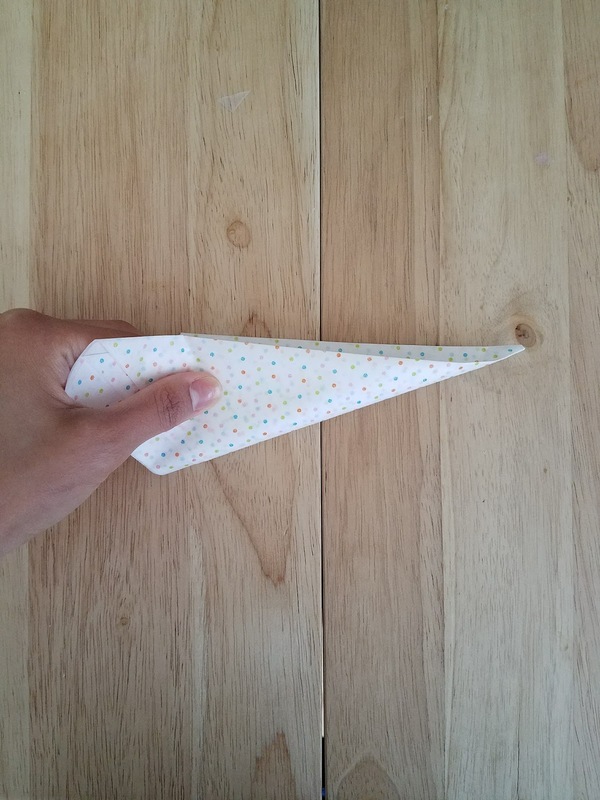 Place the cake on a rotating cake stand covered with a non-adhesive grip shelf liner (this helps the cake board stay in place as you frost it). Using an offset icing spatula, frost the top and sides of the cake with the earl grey ganache. Stick the cake back into the freezer. Take the caramel and microwave it on low heat in 30 second bursts until it is a pourable consistency. Put the caramel into a plastic squeeze condiment bottle and squeeze drips along the sides of the cake. Pour remaining caramel onto top of the cake. Stick white peonies, peony leaves, bay leaves, chamomile flowers, green mist flowers, and dark red carnations into the cake. To give the flowers more height, I stuck the stems into toothpicks and wrapped the seam with floral tape for security. Sticking this flower / toothpick combination into a cake helps it stay more securely in addition to adding volume. Just make sure you warn your guests about the toothpicks before serving the cake. Keep your cake refrigerated until it's time to serve. And voila - there you have it! 17 comments on "Earl grey and salty dark caramel cheesecake for #mortinewedding"
This combines some of my husband's favorites-salty, sweet, and cheesecake! WOW your cheesecake making skill is ON POINT!!! Wow that cake looks absolutely stunning in terms of visual and I bet it's also delicious! This looks amazing! Can't wait to try my hand at cheesecake this week. Thanks for sharing! WOW, that cheesecake is gorgeous! Great tips on how to infuse the flavor into the cheesecake. Amazing! What a beautiful wedding gift. 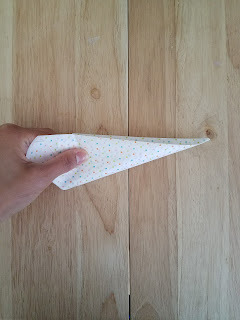 Cheesecake intimidates me, but one day, I will make this! Oh my goodness this looks so good! Me and my kids love cheesecake and putting in salty caramel is just next level. Thank you for sharing this. This looks so delicious! This combination sounds amazing. This is probably the most beautiful cheesecake I've ever seen! And I love Earl Grey in desserts! I take care of my skin so I can eat more desserts. 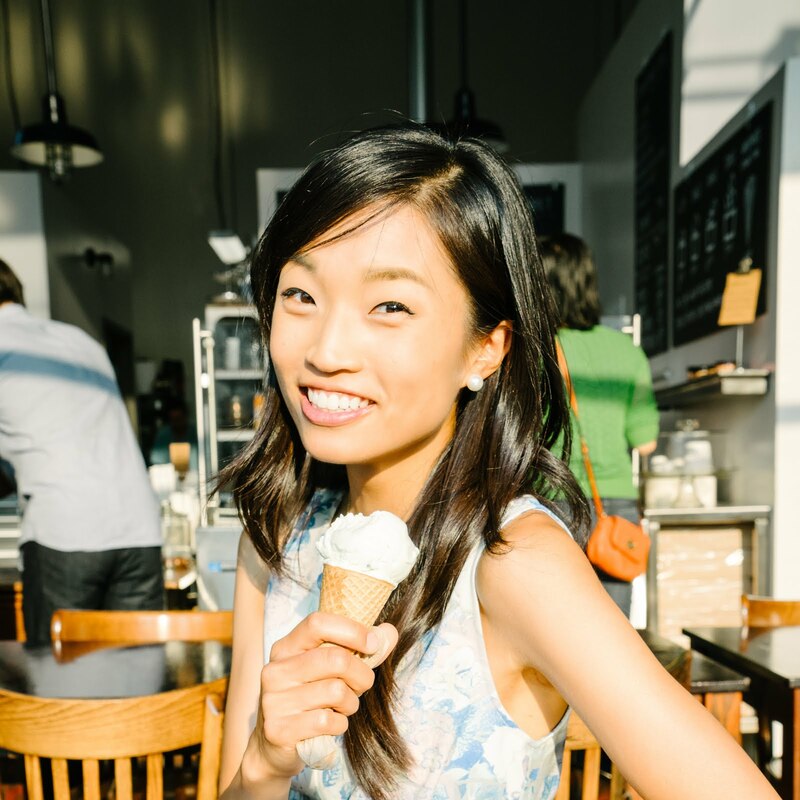 Follow me on my journey toward happy, healthy skin, and see what desserts I whip up along the way.